Princess Syalis is the princess of the human kingdom, “Goodereste,” and she has been kidnapped. The kidnapper is Twilight, who is the current Demon King, and he has imprisoned the princess in his “Demon Castle.” While the human kingdom goes into panic over its missing princess, the princess herself is… bored... and just wants to get a good night's rest. As Sleepy Princess in the Demon Castle, Vol. 6 (Chapters 66 to 78) opens, the Princess makes a bid for freedom. Why now? She wants to buy the new-fangled gadget, the “Sleep Soundly Low-Frequency Pillow.” In order to stop her escape attempts, the Demon King and two of his minions accompany the Princess to the human world to buy this hot pillow; hilarity ensues. Plus, the Princess decides to become the chef of the Demon Castle, and later, she thinks she is training a body double. 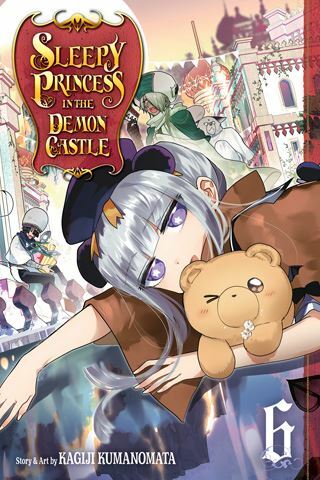 THE LOWDOWN: The Sleepy Princess in the Demon Castle manga is an episodic comedy that offers light reading and light comedy. As always, “Teddy Demons” make everything seem right with the world as this narrative goes down like warm cocoa. Sleepy Princess in the Demon Castle Graphic Novel Volume 6 offers a deeper look at the interpersonal dynamics among the denizens of the Demon Castle. As the series continues, creator Kagiji Kumanomata gives us more insight into the demons, and I have discovered that some of them are interesting outside their narrative purposes. So, the Teddy Demons are asking us to return next volume so that we can learn more.